A woody fragrance with refreshing green leaf top notes and floral accents of cyclamen and lily of the valley, resting on a rich woody base of fig and cedar warmed by touches of amber, coconut and tonka. Just lay back and play 'Hello Ducky' as he gently foams and melts into your bath releasing pure Cocoa and Shea butters, along with Clary Sage and Sandalwood essential oils. These will help balance you, restore your emotional equilibrium and moisturise your skin. Sodium Bicarbonate, Citric Acid, Theobroma Cacao (Cocoa) Seed Butter, Zea Mays (Corn) Starch, Sucrose, Sodium Lauryl Sulfate, Butyrospermum Parkii (Shea) Fruit Butters, Parfum (Fragrance), Acacia Farnesiana Gum, Aqua (Water), Santalum Album (Sandalwood) Oil, Salvia Sclarea (Clary Sage) Leaf Oil, Hydroxycitronellol, Linalool, a-Isomethyl Ionone, CI 47005 (Yellow 10), CI 42090 (Blue 1), CI 16255, CI 73015 (Blue 2), CI 77266 (Black 2). Great and fun for kids! Looks so fun, easy to use and scent is lovely. I bought this for my kids for a Christmas present, they wanted some fun bath stuff and this was perfect. 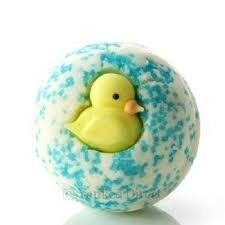 They loved the Duckie on the ball and thought it was fun to use. Will be buying one of these again for a treat for them. Wonderful scent, great for all of the family. "This is the cutest little creamy bath treat that smells gorgeous, fizzes and adds a creamy moisturising shea buttery addition to your bath. Bomb Cosmetics..."